Deborah Taylor, Global Market Communications Manager of Colorcon, recounts the reasons behind the development of this revolutionary film coating system. Now tested on IMA Active’s top-level perforated coaters. In April 2016, Colorcon, world leader in the development, supply and technical support of specialty excipients, announced an innovative breakthrough for pharmaceutical tablet coating. Opadry® QX, quick and flexible coating, is setting new productivity, efficiency and appearance standards for coated tablets. This advanced formulation greatly reduces preparation and production time, ensuring coating process efficiency and cost reduction in all types of equipment, from traditional pans to continuous coating equipment. 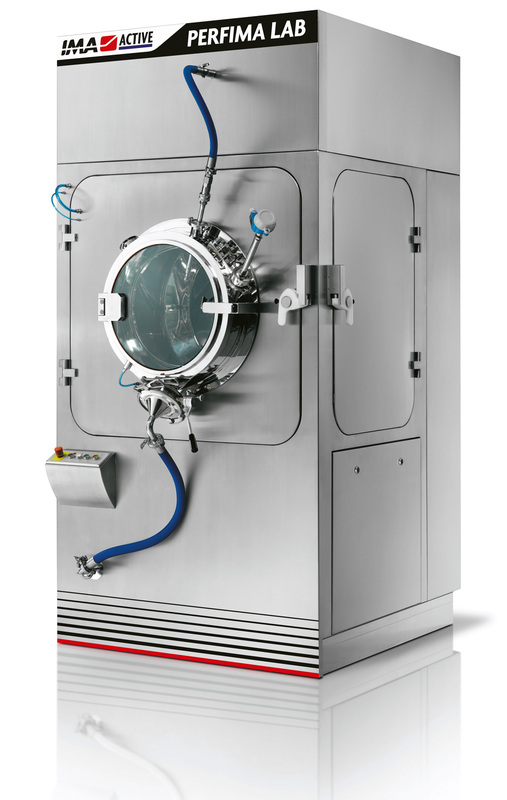 The system can be applied across a broad range of process conditions, enabling even those containing temperature-sensitive active pharmaceutical ingredients to be successfully coated, resulting in a premium quality finish for tablets. Opadry® QX is a low viscosity formulation, which is dispersed in water and ready for use in less than 25 minutes – significantly cutting preparation time. Even at high solids levels up to 35% w/w, the viscosity of the formulation remains low, allowing faster spray rates to help achieve greater productivity for each coating run. Using Opadry® QX at the typical 3% weight gain, coating uniformity is achieved significantly faster compared to alternative systems. This improved processing also means tablets are exposed for far less time to the tumbling, heat, and moisture associated with the coating process. Why did you decide to develop this new film coating system? For over 45 years, Colorcon has been developing Opadry® systems that address the essentials for film coating, while continuing to provide innovative formulations to optimize process time while delivering an exceptional finish. For immediate release applications, these include the use of color for branding and differentiation, aesthetics, taste-masking, along with light, environmental and moisture protection. Colorcon is always reassessing the evolving requirements of the pharmaceutical and nutritional producers, and addressing unmet needs. The current market focus is on continuous manufacturing and developments associated with batch consistency and manufacturing process improvements. Colorcon’s goal was to develop an innovative fully formulated system, suitable for fast application and scalable across a range of coating equipment, while still delivering color uniformity and a high quality finish. What are the benefits for pharmaceutical companies? 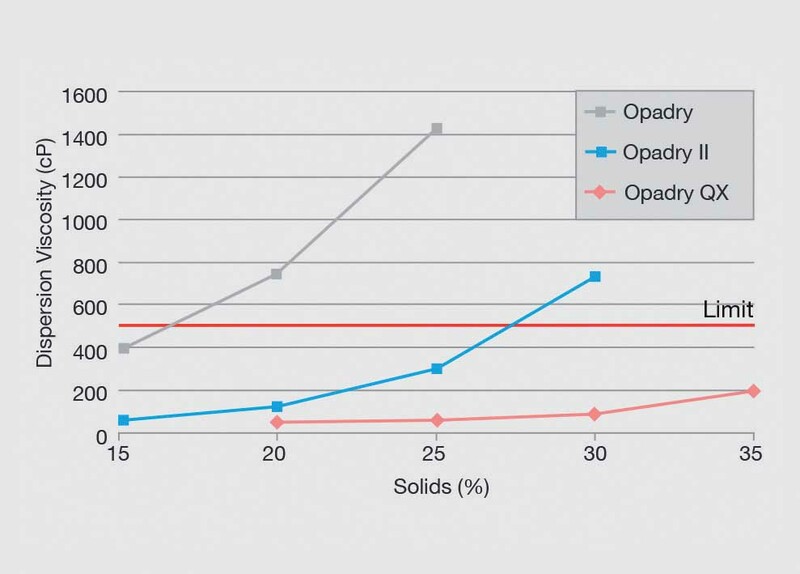 In addition to the manufacturing efficiencies and subsequent cost reductions, Opadry® QX enables trouble-free scalability from formulation lab to large production equipment. All Opadry® systems are formulated using high-quality materials designed to meet global compendia requirements and are available in a wide range of color options, matched to the end customer requirements. Due to the complexity of pharmaceutical regulations worldwide, Colorcon applies its years of formulation expertise to deliver a system for the local market to meet the customer’s specific goal. All ingredients used in Opadry® QX, as with all our film coatings, come from accredited sources supported through a global business continuity program (BCP). As a result, no supply chain interruptions are experienced by the user. Regulatory filing information packages are also available from Colorcon, making the customer’s application process that much easier. What about for continuous manufacturing? As the industry seriously considers a transition from batch to continuous manufacturing, there is a need for coatings that are compatible with continuous processes operating at higher speeds, without compromising final tablet appearance. 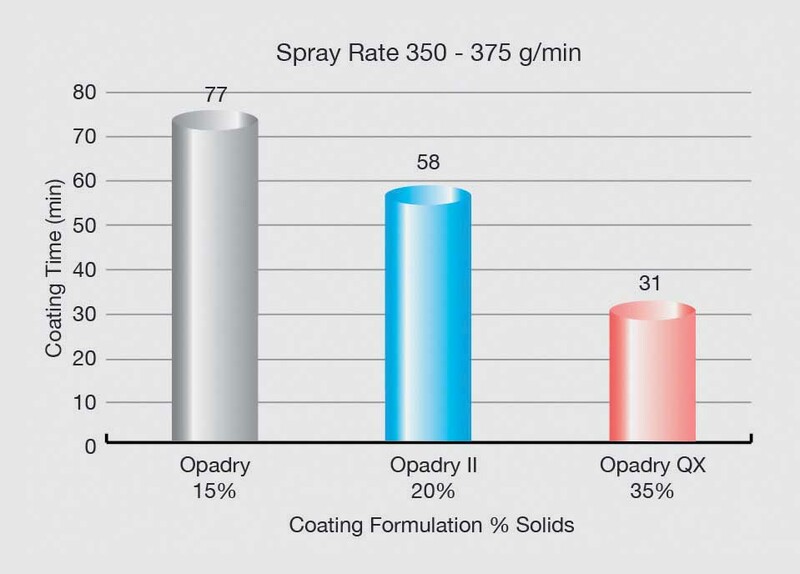 Opadry® QX was developed as a coating that can be sprayed much faster, with higher levels of solid in the coating dispersion, which significantly increases productivity while still delivering the perfect finish. Do some pharmaceutical companies already use this new system? There are a significant number of products in active development; obviously, details of the customers’ projects are confidential. Opadry® QX has created a great deal of attention from both innovator and generic companies, as the scalability and speed of application are very attractive, as well as the perfect finish. With the aim of testing the Opadry® QX performances on IMA equipment a series of tests were performed on IMA perforated coaters. Tests were run on both pilot and production scale coaters to demonstrate the good scale up properties of the new formulation. Round shaped placebo tablets (Lactose Spray dried 60%, Avicel pH 102 39%, Magnesium Stearate 1%) providing a mean weight of 280 mg, mean diameter of 9 mm and mean crushing strength of 90 N were used as substrates for all the trials. 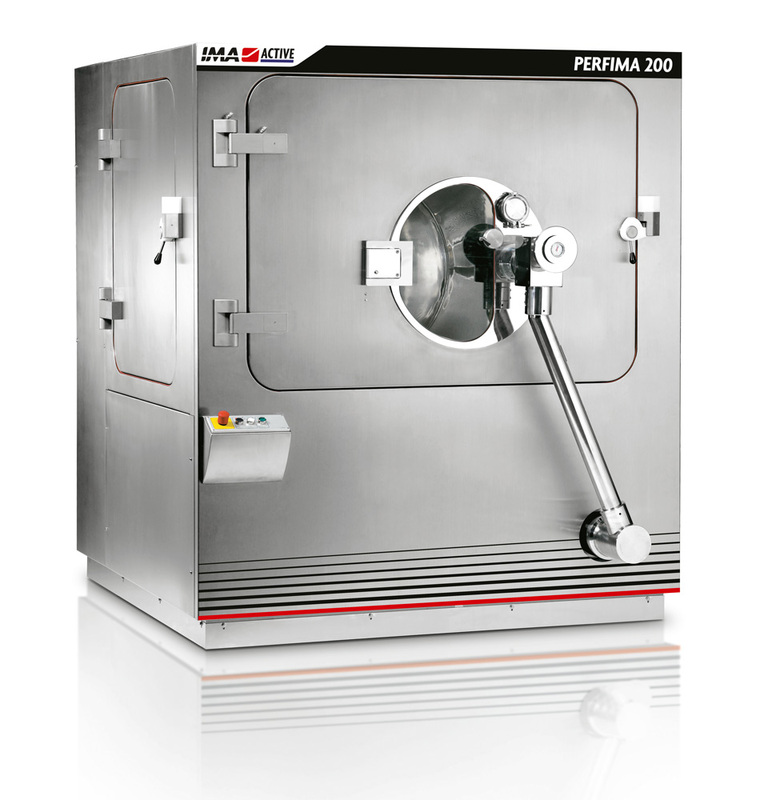 Initial tests on the Perfima Lab (drum 70 L) were performed with a batch size of 40 kg of placebo tablets, which represents 70% of the maximum drum volume. A 4% weight gain was applied by using Opadry® QX prepared at 30% in water (total dispersion applied 5,330 g). The test parameters are reported in Table 1. The best combination of good coating quality and minimum process time was found with a slot of three tests leading to a 40 min coating time. The process was then up-scaled to a production coater providing a pan volume of 250 L again using a 70% filling volume and the same tablet characteristics. Tablet temperature was similar to the pilot tests, and as a consequence the outlet air was maintained in a comparable range. Peripheral speed was kept similar at 0.55 m/sec. Nozzles were increased from 1 to 4 so, inlet air volume and spray rate were multiplied by 4 to keep similar wetting conditions. This required a small adjustment in the gun distance to bed and atomization pressure (Table 2). Two tests were enough to successfully scale up the process and achieve perfect final coating quality. Based on these trials, we conclude that combination of the low viscosity of the Opadry® QX formulation, combined with the high performance coater, even when sprayed at high delivery rate, it was not a challenge to manage the process on both IMA pilot and production coaters. This provides an easy scale up procedure and ensures very short coating times compared to other coating formulations.